A Billion here, a billion there -- pretty soon you're talking real money. Attributed to Senator Everett Dirkson in an undocumented speech. Tour down through the illustrations, taking time to understand each one. $100 - Most counterfeited money denomination in the world. Keeps the world moving. 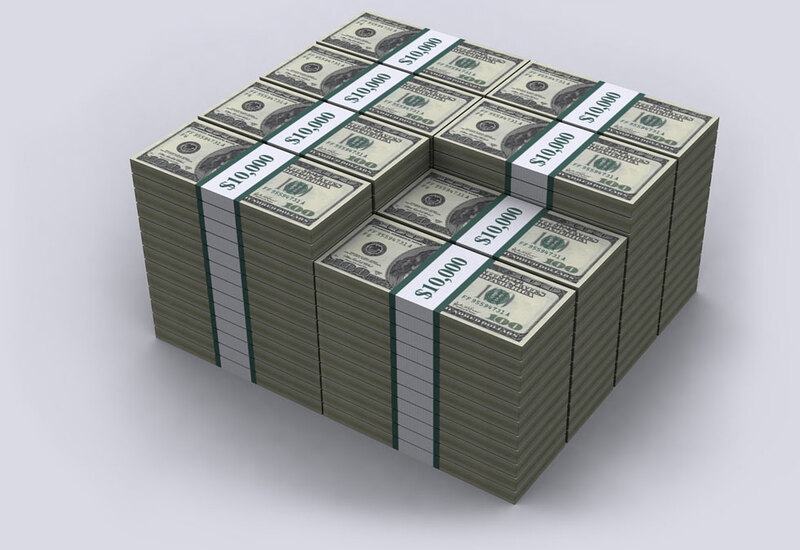 $1,000,000 - Not as big of a pile as you thought, eh? Still, this is 92 years worth of work for the average human on earth. $100,000,000 - Plenty to go around for everyone. Fits nicely on an ISO / Military standard sized wooden pallet. $1,000,000,000 - You will need some help when robbing the bank. Now we are getting to serious money! 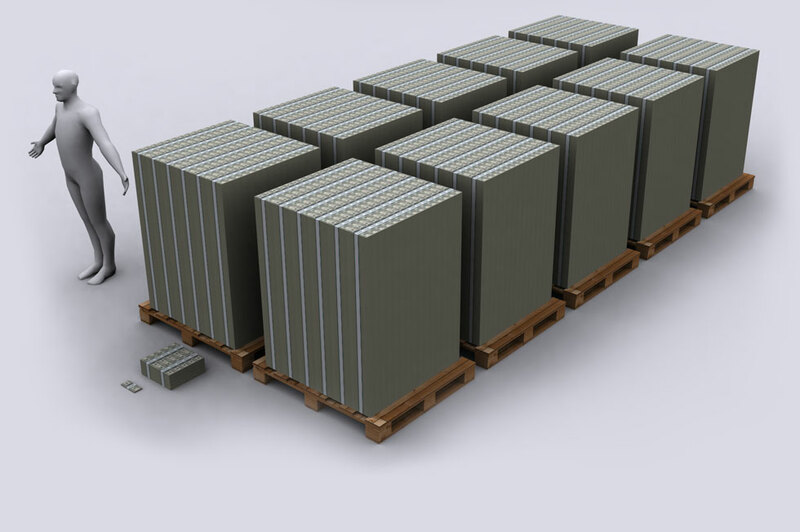 Keep in mind it is made of double stacked pallets of $100 million dollars each, full of $100 dollar bills. You are going to need a lot of trucks to freight this around. 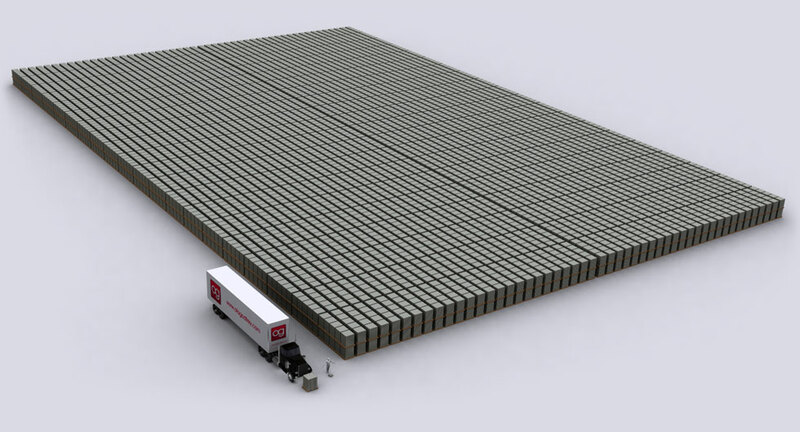 When the U.S government speaks about a 1.7 trillion deficit, this is the volume of cash that was borrowed in 2010 to run things. If you spent $1 million a day since Jesus was born, you would have not spent $1 trillion by now...but $700 billion -- the same amount the banks got during the 2008 bailout. Comparison to a standard-sized American Football field and a European Football field. Say hello to the Boeing 747-400 transcontinental airliner that's hiding on the right. This was until recently the biggest passenger plane in the world. 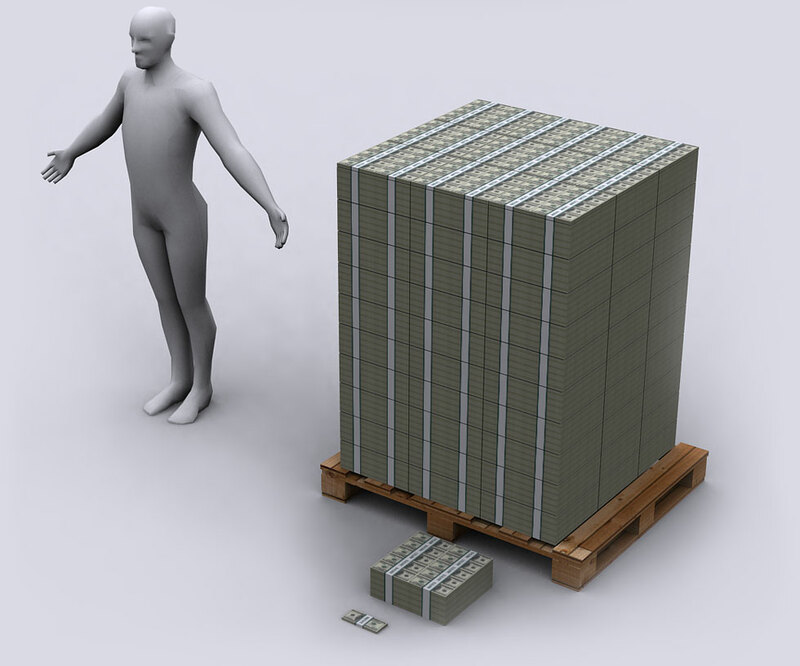 Unless the U.S. government fixes the budget, US national debt (credit bill) will top 15 trillion by Christmas 2011. The Statue of Liberty seems rather worried as United States national debt passes 20% of the entire world's combined GDP. (Gross Domestic Product). In 2011 the National Debt will exceed 100% of GDP, and venture into the 100%+ debt-to-GDP ratio that the bankrupting European nations (PIIGS) have. 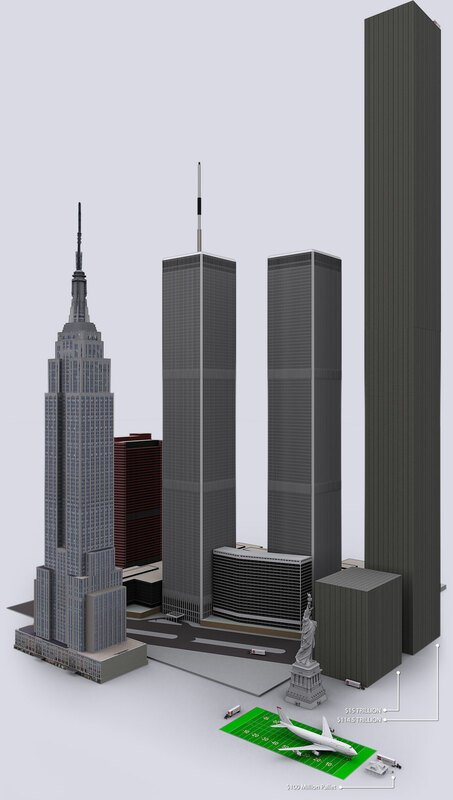 To the right you can see the pillar of cold hard $100 bills that dwarfs the WTC and the Empire State Building - each at one point world's tallest buildings. If you look carefully you can see the Statue of Liberty. The 114.5 Trillion dollar super-skyscraper is the amount of money the U.S. Government knows it does not have to fully fund Medicare, the Medicare Prescription Drug Program, Social Security + Military and civil servant pensions. It is the money the USA knows it will not have to pay all its bills. If you live in USA this is also your personal credit card bill; you are responsible along with everyone else to pay this back. The citizens of USA created the U.S. Government to serve them, this is what the U.S. Government has done while serving the people. 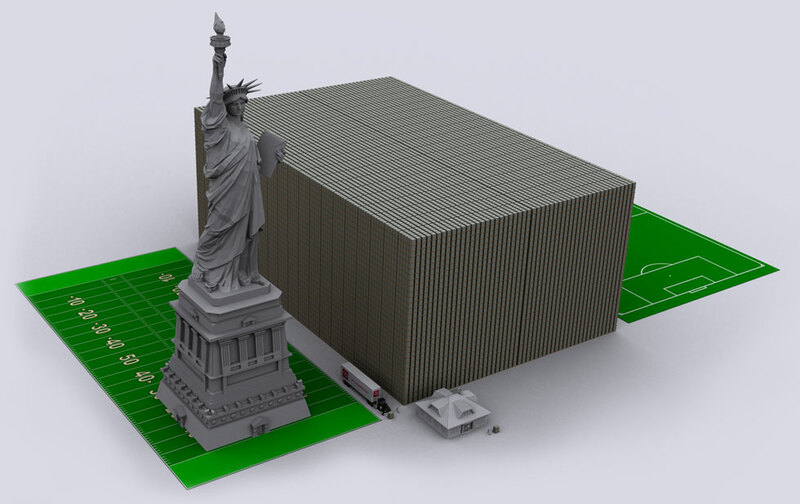 Note: On the above 114.5T image the size of the base of the money pile is half a trillion, not 1T as on 15T image. This was done to reflect the base of Empire State and WTC more closely. Source: Federal Reserve & www.USdebtclock.org - visit it to see the debt in real time and get a another grasp of this amazing number.